U.S.’s Alex Morgan to share FIFA ‘16 video game cover with Messi. 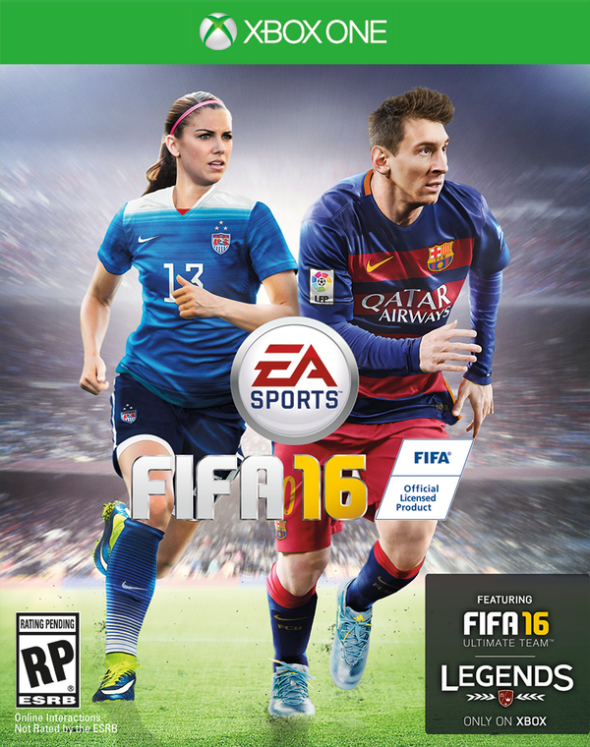 The U.S. cover for FIFA ‘16 video game. U.S. national team star Alex Morgan will make a historic debut on the cover of the FIFA ’16 video game, the first time a woman has done so on the EA Sports soccer game. Morgan will share the cover with Argentine superstar Lionel Messi in the U.S. market when the 2016 version of the game is released in September. In the Canadian market, Canadian captain Christine Sinclair will be on the cover. Morgan won’t only be making an appearance on the outside of the game, she and her teammates and competitors will also be a part of the game play of the videogame franchise for the first time. So, along with Messi’s Argentina squad, gamers can now play with a dozen women’s national teams: Australia, Brazil, Canada, China, England, France, Germany, Italy, Mexico, Spain, Sweden, and the U.S.